In one of our barefoot running debates, a well-known barefoot running PhD, made the claim that foot orthoses weakened feet. I told her that in my 30 years of seeing thousands of runners feet, both as patients and in running clinics, that I had never seen a runner that habitually wore orthoses have “weak feet”. However, I did say that I had seen plenty of minimalist shoe runners develop stress fractures of their metatarsals who, after walking around in a cam boot for a month, had developed weak feet as a result of them being injured running in their Vibram FiveFinger or other minimalist running shoe, on the advice of one of the self-proclaimed running experts they listened to. Like you said, most of the barefoot running “movement” was a virtual trend, many people talking about it on the internet, very few runners actually doing it. I’m interested in maybe what one would call the sociology of the barefoot phenomenon, specifically the belief that running barefoot is evidence of being stronger. It strikes me that this woo belief fundamentally misunderstands what an orthotic does, which as I understand it does *not* prop up the foot, but merely changes the surface against which the foot pushes. Interesting point! I have not thought of it that way, but would never promote a foot orthotic that way as that is not their purpose! http://www.runresearchjunkie.com/barefoot-science/ – with no evidence! They also claim on their website that the type of orthotics used in the studies above weaken muscles … go figure! How big were the other test groups? All I see in that table above is error–the error bars are much too large to draw any reasonable conclusions about whether or not the columns and rows correlate. That’s interesting in and of itself, does just as much to disprove the idea you’re attempting to refute. However, it would seem as if saying that the orthotics group was stronger in any category is an incorrect statement. There was 20 and 23 in the other groups. They are not “error bars” but standard deviations. I did not report it above, but non-parametric stats showed that the orthotic group was stronger in some tests; I just did not report those numbers due to the numbers in the barefoot/minimalist group. So, your claim that my clam is incorrect, is well, incorrect. The data is consistent with all the other studies on foot orthotics and muscle strength. Given the sample size issue, the data has to be interpreted for what it is. The main conclusions that can be made is that the orthotic group is NOT weaker that other groups and the barefoot/minimalism group is NOT stronger – which is the opposite of what the fan boys keep claiming in the absence of any data to support their claims. I’ll admit that I’m a physical scientist–on plots in scientific papers, standard deviations are often denoted by bars–and these bars are then appropriately named “error bars”. I suppose in situations where there isn’t a true value those terms may be inappropriate. (of course, the second part of that sentence: “so there are clearly not the remotest hint of a trend towards the foot orthotic group being weaker and the barefoot/minimalsiut group being stronger as the rhetoric and propaganda from the fan boys would have us believe” would actually be supported by the data you’ve posted. I’m not trying to call into doubt your conclusions–but be careful about holding a unconscious bias simply because you want to call out the pseudoscience. A podiatrist who has a website called ‘running barefoot is bad’ – I’m not sure it’s an unconscious bias. No one was being biased here. The research student doing collecting the data did not know what group the runner was in. The data speaks for itself. Too bad it does not support what you want to believe. You know absolutely nothing about what I actually believe or want to! 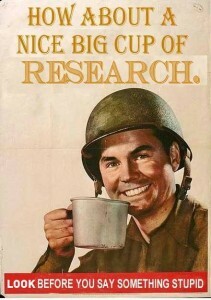 There are those among us who are angered by a misuse of statistics even when they support what we think. The researcher may not have been biased, but your comments above most certainly were, and were incorrectly drawn from the data given. If you’re going to make conclusions based on hazy statistics (such as ” It is pretty clear that even though there is only 4 in the minimalist/barefoot group, the orthotic group is stronger” ), with at most poor-correlations, that’s fine, but it doesn’t jibe with the research high horse this blog is pinned to. Hear, hear and well put. The trouble is that you can’t teach an old dogma new tricks. Its not a blog for discussion……unless you agree with Paynes point of view. It sure is difficult when your point of view is repeatedly contradicted by the evidence. It must be difficult coping with that. Nope. The data speaks for itself. What point of view is that? Are you making assumptions based on little evidence or just jumping to conclusions…………. pretty much like some of your blog. At the end of the day, I presented the above data for what it is. As for the orthotic group. The data showed that there was no weakness and maybe an increase in strength. Every single study on foot orthotics and muscle strength have shown the same thing. It does not matter of I may be biased or not; the evidence is totally consistent and ALL showing the exact same thing. Its not a matter of agreeing with me or not or if you think I am biased. Its what ALL the studies are showing. The fan boys are obviously not happy that the ALL the current evidence is showing this. I will be the first to report a study that might show the opposite and be the first to change my mind if the preponderance and strength of evidence shows the opposite to what ALL the current evidence shows. As for the minimalist group; yes there was only 4 as that is all we could find as so few people are doing it! But even with that small number there is not remotely close to their being a hint the the minimalist group are stronger and the shod group are weaker. It does not matter of I may be biased or not; the evidence is totally consistent and ALL showing the exact same thing. 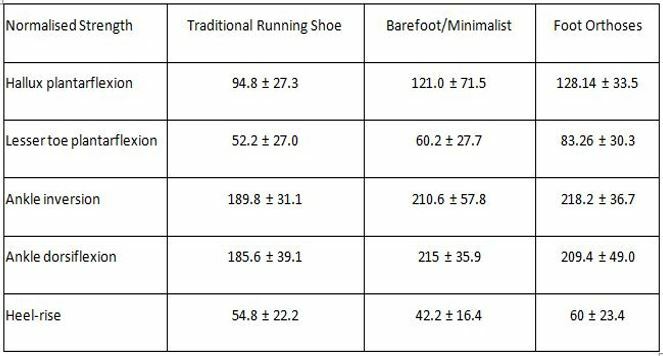 The Goldmann study showed the traditional running shoe group and the minimalist group both got stronger (no weakening!). No study has shown weakness. then there the other studies showing no increase in arch height with barefoot/minimalism; etc. It does not matter of I may be biased or not; the evidence is consistent. The fan boys are obviously not happy that the current evidence is showing this. I will be the first to report a study that might show the opposite and be the first to change my mind if the preponderance and strength of evidence shows the opposite to what the current evidence shows. Everything you said above was correct. What one can take from this study is certainly that there is no disadvantage to foot strength in using orthotics–I’m totally on board with the numbers you quoted there supporting the above statement. This sort of turned into a mountain from a mole-hill type situation–my only real qualm was when you said the orthotics group was stronger, which I don’t see as being supported by the data you’ve given above–and as someone who often has to read research papers that have phrases akin to “it’s very clear that..” “it’s obvious that..” I take offense when I see one. Again, though, you have no idea whether or not I run in a pair of Brooks Beasts or water shoes and regardless, it’s not particularly relevant to my objection. I’m speaking from personal experience, having worn orthotics for several years and been barefoot for several years. On this note I don’t see why anyone, even a barefoot enthusiast would be upset by the outcome of this study. In fact I see it has a good thing, its basically saying your lower legs/feet don’t have to work as hard going barefoot, which I have certainly noticed.